The Group 2 BRC Sires’ Produce Stakes, formerly the QTC Sires’ Produce Stakes, is a feature race for two-year-olds previous run on Doomben 10,000 Day. It now takes place at Eagle Farm Racecourse in late May each Brisbane Winter Racing Carnival on the new-look Kingsford-Smith Cup Day. Held on the same day as the Group 1 Kingsford-Smith Cup (1300m), which was formerly known as the BTC Cup, the 1400m contest is run at set weights and is a key lead-up to the Group 1 JJ Atkins (1600m) at Eagle Farm the following month. Offering a total of $250,000 in total prize money, the BRC Sires’ Produce Stakes attracts the winter’s top juveniles and the last to complete the BRC Sires’ – JJ Atkins double was Sizzling (2012). The latest edition of the BRC Sires’ Produce Stakes took place on Saturday May 26, 2019 . BRC Sires’ Produce Stakes betting markets favour two-year-olds with proven ability in Group races in either Brisbane or Sydney. Previous Group winners, those with form over at least 1200m and the best out of a lead-up race like the Group 2 Champagne Classic (1200m) at Doomben a fortnight earlier all head the markets. The race makes a popular betting double with the following month’s JJ Atkins at Eagle Farm Racecourse and favourites have a strong recent BRC Sires’ Produce Stakes record. The season’s official BRC Sires’ Produce Stakes 2019 betting odds will be available on the hopeful two-year-olds right here the week of the race so stay tuned for access to the best Brisbane racing odds on the JJ Atkins-bound youngsters. Sizzling (2012) was the last horse to complete the BRC Sires’ – JJ Atkins double. Photo Credit: Daniel Costello. The BRC Sires’ Produce Stakes field features a line-up of the best performing two-year-olds of the season from local and interstate stables. Runners come via a number of different lead-up races, but the traditional path is via a run in the Group 2 Champagne Classic (1200m) at the Doomben track a fortnight earlier. 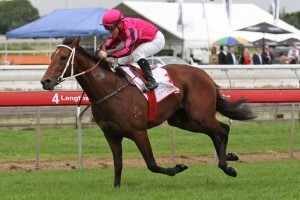 Sizzling (2012) was the last horse to complete the Champagne Classic – BRC Sires’ Produce Stakes double. He also went on to take out the Group 1 JJ Atkins over the mile, then known as the TJ Smith, and so completed the Queensland 2YO Triple Crown. The other runner to win all three Brisbane Winter features was Pressday (2010), while other recent winners of the Champagne Classic – BRC Sires’ double include Virage de Fortune (2005) and Lovely Jubly (2002). BRC Sires’ Produce Stakes nominations close the Monday before the race with the final field and barriers out on the Wednesday. The official BRC Sires’ Produce Stakes 2019 final field & barriers will be provided below as soon as acceptances are taken by Queensland Racing on Wednesday May 24, so bookmark this page to see what juveniles make the cut for the set weights clash. The 2019 BRC Sires’ Produce Stakes Field attracted a capacity line-up of juveniles led by Chris Waller’s Champagne Classic winner Tangled chasing the double and fellow co-favourite for next month’s JJ Atkins Melody Belle over from New Zealand. The BRC Sires’ Produce Stakes form guide features all the crucial race information like the saddlecloth numbers, jockeys, trainers, barriers and lead-up runs of the two-year-olds in the field. Looking for Champagne Classic graduates on the form is important, as is seeking out the well-performing youngsters drawn a good gateat the Eagle Farm track, where the race has been held since 2017. The BRC Sires’ Stakes form has also stacked up plenty of times in the JJ Atkins over the years including in 2011 when Benifca improved on a sixth in the Group 2 before a win in the Group 1 next time out. Either side of that Pressday (2010) and Sizzling (2011) won the double, while Apercu (9th in 2007), Rockdale (2nd in 2008) and Linky Dink (10th in 2009) also all won the JJ Atkins (TJ Smith) after a lead-up run in the Brisbane Sires’ Produce Stakes. BRC Sires’ Produce Stakes tips include looking for youngsters coming off a win in a similar class race like the Champagne Classic in Brisbane or a Sydney equivalent and to back runners with winning form at least up to 1200m. The Champagne Classic is the key lead-up into the BRC Sires’ Produce, so another good betting tip is to follow that form line. Our Ladbrokes’ insider BRC Sires’ Produce Stakes 2019 betting tips with the two-year-old gallopers to back and sack this winter will be detailed below a day or so out from the race so stay tuned. BRC Sires’ Produce Stakes results in recent years show an even spread of local Brisbane-trained winners as well as successful interstate raiders. Some of the more notable BRC Sires’ Produce Stakes winners include Zoustar (2013), Sizzling (2012), Pressday (2010), Shoot Out (2009) and Danleigh (2006). The official BRC Sires’ Produce Stakes results & finishing order for the 2019 edition of the race will be published here as soon as the race takes place on Saturday May 26, 2019 .